On a recent rainy autumn evening, (rare in Tucson), I got around to playing with some photos--I'd been thinking about grouping them for a project...both fun and pensive. 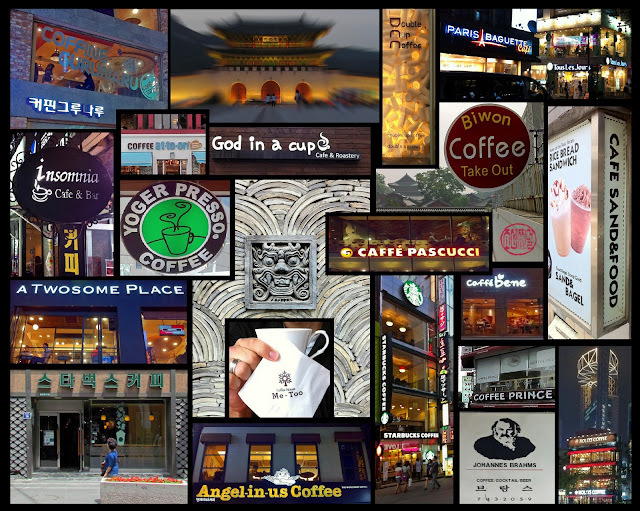 Seoul has to be Asia's most caffeinated mega-city. There is plenty of tea to be had, but coffee rules in Korea's capital. 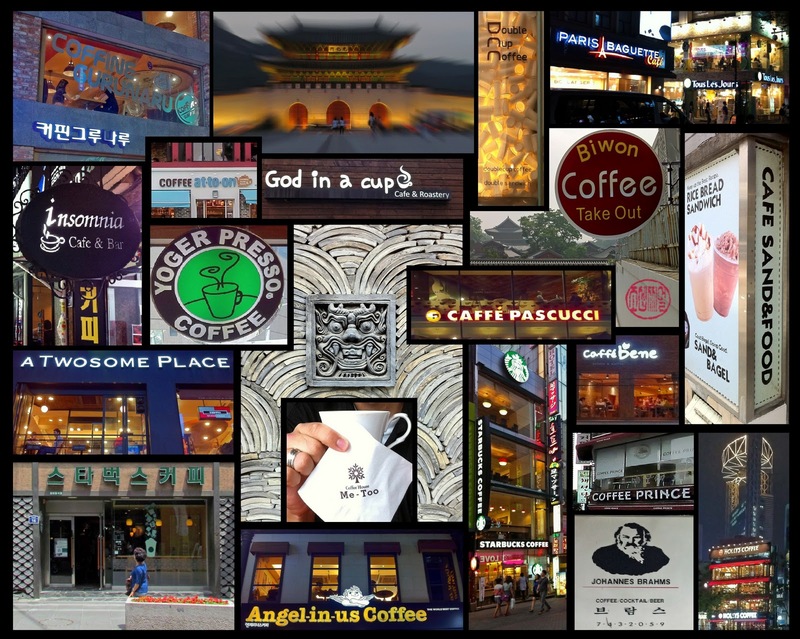 Along with an abundance of multi-storied Starbucks, every street seems to have sprouted a home-grown café: from the Italian-inspired (Pascucci, Caffe Bene) to the French (Paris Baguette, Tous les Jours), the sacreligious (God in a cup) and the pseudo-religious (Angel-in-us), royal (Coffee Prince) and musical (Johannes Brahms), prepositions ("at-to-on"? ), from the purely Asian (Gurunaru), to delightfully fractured English (Yoger presso, A twosome place, Me Too, cafe sand&food). Coffee and kimchee--it's what Koreans run on! 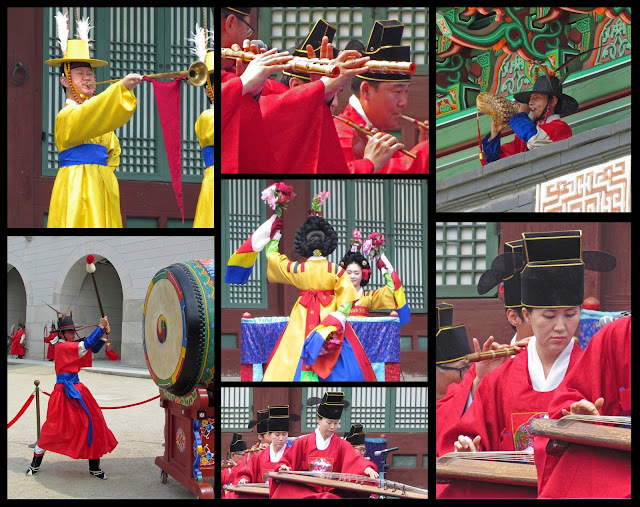 Late spring and early summer in Seoul: musicians in medieval clothing infuse the grounds of Gyeongbok Palace with a sense of its storied past. The last two decades have seen a remarkable period of revival and rebuilding. Today about forty percent of the palace has been restored. With colorful concerts, tea-ceremonies, and the changing of the guard, this palace is shining once again. I'd tagged along with my uncle as he drove from Seoul to the mountains along the east coast of Korea. We were going to pick up my aunt, who'd just spent a week-long retreat at Sang-won-sa, a "Seon" ('Zen' in Korean) temple established in the year 643. While they spent the morning around the grounds, I went for a hike. This national park, near the site of the upcoming 2018 Winter Olympics, is dotted with Buddhist sites established in the 6th and 7th centuries. 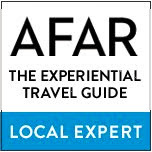 (Odae-san is one of Korea's 'holy mountains.') 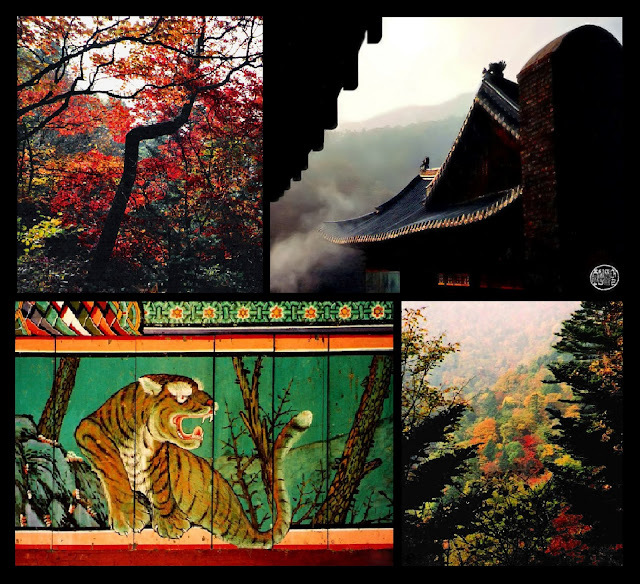 During the fall, the temple's vibrant architecture blends in perfectly with the forested slopes; the colors of the folk-paintings seem to spring from the mountains themselves. Okay, dying to know how you made those picture collages. They're wonderful!!! Really great post, Joe. I love the thought of speaking in the language of your personal library. Hope the Korean gels quickly for you!